J.L. Campbell: The Grand Unveiling! Some of my not-so-new blog/writing friends would know that I am getting my feet wet in the waters of self-publishing. Being cautious, I have taken some time to learn as much as I can on the journey. While I am still being published traditionally, I am absorbing what goes into self-publishing. I didn't realize I was doing this before I made the decision to also go that route. The first thing I plan to publish is a short story that’s close to my heart. I’m not sure why I chose to write this one, but let’s just say, it’s the condensed version of the novel I plan to publish later this year. It’s called Giving up the Dream. I pestered some of you with samples of the original cover I did (see below), but after hours of searching, came up with what I thought was a better idea. See my shiny new cover below. It’s simple, but I love it ‘cause it conveys the essence of giving up a dream of the heart. This story will be free. I forgot about the contest until today, but I'm entering this cover in the Design Your Own Cover Contest over at A Writer's Journey. The next cover has to do with a set of stories I plan to release at the same time as GutD. At different times, I entered these stories in the Jamaica Cultural Development Commission’s Creative Writing Competition. I was awarded silver medals for three of the four stories in this collection. Rather than let them languish on my hard drive, I’ve dusted them off and will be offering them on Smashwords and Amazon. My friend Tirzah did the cover for Don’t Get Mad…Get Even. (She's a riot. Go visit her!) And yes, the stories are tales of revenge of one sort or another. Disclaimer: I’m really not a bad person. Honest. This baby step isn’t a moneymaking venture, but more of a let’s-see-if-I-can-get-organized-enough-to-do-this kind of project. Of course, the novel will be more of an effort, but thank God for friends on the journey. For now, I’m satisfied. God willing, my launch date for these two projects is September 19, 2011. I should tell you, I’ll be hitting up some of my blogging buddies for interviews and such. Ask and you shall receive, right? And I do return favours, so not to worry. Any time you want to lounge around here and chat about your work, feel free to hit me up. Any thoughts or suggestions on the covers or the self-publishing journey? Feel free to share. What gorgeous covers. I do like the second one for Giving up the Dream, more so than the first. I had the same indecision when I did up my cover (which I revealed today, stop by and take a look if you can) for The Lady's Fate. 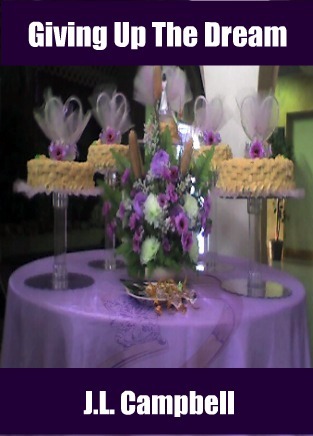 I had a similar design for mine with the flowers as you did for yours. I went for more traditional. But I love yours. Especially the girls face in Don't Get Mad Get Even. Oh yes, she looks scary. I have to say that your "project" looks like a success. Really like the Giving up the Dream cover. Coming up with a cover is such hard work and can be so tricky, considering all of the various elements involved in the decision. Job well done! I love your shiny new cover! Perfect. And I like the second one as well... though the background seems a little "busy" to me. You're the most organized person I know, so I know you can do this. And my desire to interview you is still unrequited... sigh! Let me know if you're still interested. I'd love to interview you at my blog! I don't remember if I sent you the questions. If I didn't, or if you need them again, let me know. You can choose the format... traditional Q&A or the format I used with Molly Ringle's interview. I love the new cover. And between the cover and the title, I'm very interested in reading the story! Thanks, Ann. I find that I am very indecisive when it comes to cover. I do prefer plain and simple, but have to explore EVERYTHING before I make a decision. :) Coming around in a bit. Isis, I really like the cover too. It's a long way from where I started, but I like the results. Thanks, Ruth! Glad the cover is somewhat intriguing. Doralynn, I don't often feel organized, but I did one of my favourite things today. I started another 5 segment notebook for the different projects I'm working on. :) Wish me luck with that. Oh you can be sure, I want that interview. I'll want to time it sometime close to when I have these stories up. Not sure if I got the questions and lost them. Would you send when you can? Thanks! The covers are beautful! Where did you find the art work? Did you have to pay for it, give credit to the artist? 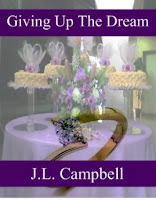 I love the new Giving up the Dream. Its simple but much more impactful. Did you use the build it yourself article to do it? If you want me to convert to 300 DPI for your ebook, let me know. I cna do that. I'm super busy in August and a little distracted but it would only take a minute. Yeah, the street scene is busy but it's an actualy picture Joy took in Jamaica. It's a real place. We tried several street scenes for the cover and that one worked best. I like it a bit less busy myself but I think overall it works because it'll attract readers from that area. It'll look familiar. 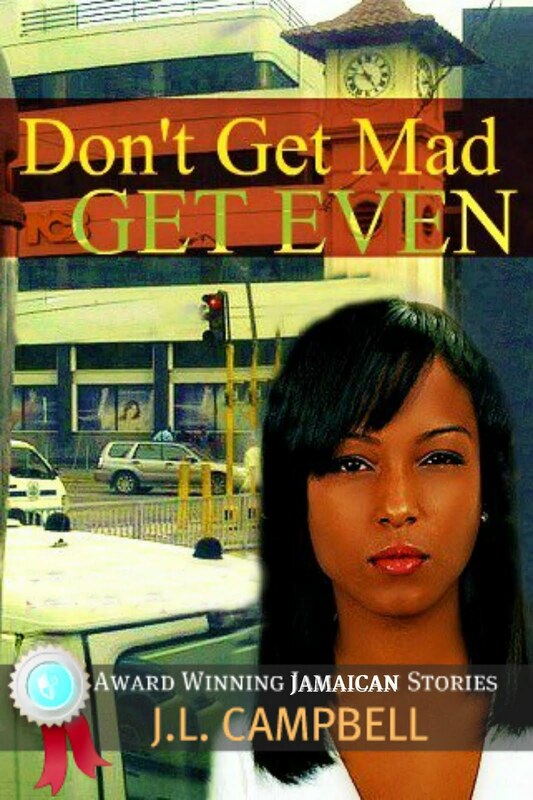 For the Don't Get Mad cover Tirz bought the picture of the girl. The background is a shot I took in Half-Way-Tree. Thanks - that's lovely coming from you. :) I used Fotoflexer using the technique you wrote about in the article. I used the photo of the couple over the other one. Yes, definitely would want you to convert photo for me. Don't have a clue how. I'm super grateful to you for sharing what you know about making covers. The article you wrote demystified the whole thing for me. I love the Giving Up The Dream cover...beautiful. I like the new cover, it is clean and the images there tell more of a story than the table in the earlier ones. Good luck with your foray into self-publishing. Giving up the dream sounds sad. Yes, Sarah. It's wonderful to settle on a cover. The first time I put the new cover together I kept going back to look at it and smiling at it. It feels right when you finally have something that really works. Corinne, yeah, I like a clean cover too and yes, I think it tells more of a story. Thanks for your good wishes. Michael, it is a sad story. Joy, I LOVE your redesigned book cover. It books the emphasis back onto the characters, the opaque layering conveys a dreamlike sensation, my eyes move well through the design, and the title and your name add classy balance. Congratulations! I'm hopping over to vote for your cover ASAP. And you're right; Tirzah is as talented as she is witty. Any time you'd like to be interviewed on Bird's-eye View or do a guest post, the blogging door will always be open. Cool covers, especially the third one for 'Giving Up The Dream'. Good luck with your self publishing venture. 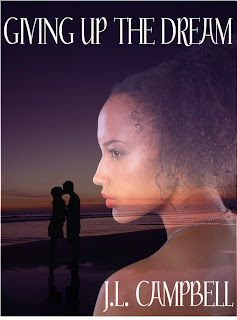 The new Giving Up The Dream cover is not only stunning, but it gives me visual hints about the story, which make me want to read it. JL, I've been following you around all morning, and finally made it to your site. I'm a new follower (dumb pun!). Really lovin' the second cover - great job! Wow! Big congrats:) It looks like your making some real progress into the world of awards and publishing (self or otherwise). Very neat! So how long until I see your stuff on the shelf at the local bookstore;) ? Ooo, I especially love "Giving up the Dream." Thanks for participating! Michelle, I love it too and yes, it does speak to the character. Thanks so much for the vote. Yes, Tirz is special. You can be sure I'll take you up on the guest post or interview. Thanks for dropping in, Hywela. Cynthia, I knew the cover was right the minute I found that second picture and dropped it over the first one. Something just clicked. Glad others like it too. Mark, thanks. I'm working on that. Apart from the two books that are out now, I have another coming coming out this year under a pen name. I expect I will have another book (self-published) out late in the year. Working on the 'in-stores' part of your comment. Thanks, Teralyn. I'm loving that cover too. I loving the last try. Its everything that would make me grab it off the shelf. Well done. I really like the revenge one too. Super. I love the new cover! It's freakin' awesome! Light years ahead of the other two. Good on you!! And September 19th? International Talk Like a Pirate Day? Argh. Good luck on your launch. I'm so glad your award winning work is going to languish on your computer. Wow, those are amazing covers, Joy! Good luck in the contest and with your self-publishing endeavors! Donna, that's exactly how I feel about it too. Laura - the wonderful thing is that they were fun to create. Thanks for your good wishes. Hi J.L., I'm sending the questions now. If you don't get them, just let me know. Beautiful covers! I love the whimsical feel of love the first one portrays. I want to get my hands on it! Cover win! 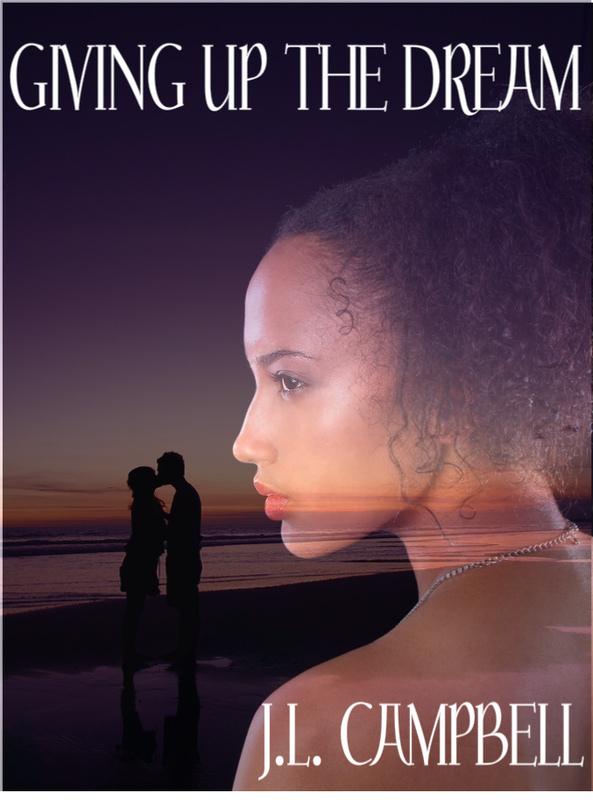 Love both of them so much: I think Giving Up The Dream's cover is so much more powerful now with this new image. Oh JL. The cover you settled on for GUTD is *beautiful*. I love it. It says so much. Not to mention the girl is so sad and lovely. And I would be honored to help you spread the word for your book! Lovely covers, Joy...am so glad you're doing this. Can I do an interview with you or would you like to do a guest post so I can promote your books in either/both my blogs ? Thanks, Elizabeth, I'm liking it lots better too. I wouldn't turn down a wonderful offer like that, Damyanti. I'll email you. I love the last one...her expression is priceless! LOOOOOVE the new cover. As someone commented above, it really helps set the scene. What a Fantastic blog you have! I love the look of it! And I love your new cover. I'm a fellow campaigner in the Women's Fiction group. It's so great to meet you! Congrats on the self-pub route. I just jumped into the waters myself this summer and have been VERY pleased. Your covers look great! I can't wait to check them out. I love the covers. I'd be happy to review and promote as best as I can. LOVE, LOVE, LOVE the covers! I love all this experimenting that's going on and appreciate when the authors share what they learn from their experiences. I wish you much success. The bookcovers look great. Fab covers. I like the second one for Giving Up the Dream. I think covers are SO important. They can make or break a book, in my opinion! Please don't hesitate to let me know if I can do anything to help! Thanks for your kind words, Brenda! Nice to meet you too. Thanks, RaShelle. I agree, purple is a lovely colour! Heidi, yes. I think she conveys the revenge theme nicely. TEC - Thanks! The story's not live yet. Didn't think about putting it on Goodreads, but that's a cool idea. Thanks for the encouragement, Elena. Glad to know that self-pubbing is working out for you. Clarissa, thanks every so much. I'll definitely take you up on that offer. AA - Glad you like them! Thanks, Arlee - the best thing that comes from sharing for me is the encouragement and I advice I get in return. That's priceless. Talli, thanks. I totally agree with you on the important of covers. Will let you know if and when I think of something. You've been an inspiration when it comes to ideas for getting the word out. Ahh looks like you have had some experience with designing book covers already, as yours all look fantastic. Giving Up the Dream is also pretty neat-looking. The only thing is I feel like the title isn't exactly wonderful, and gives away too much. TRA, the only experience I have is in designing the first two purple ones. I did them last month. Got a real good friend whose article with instructions is super easy to understand. I took the pic for the Get Mad cover and she did the cover. I like it too. I understand what you mean about the GutD title. My word, look at all these comments. Just like to add my voice: congraulations on the lovely covers, J.L. I'm looking foward to hearing all about your indie adventures. Deborah, I've always found the writing community to be supportive. It's wonderful to have so many great people giving encouragement. Thanks, Tina. I'm liking them too! many of the world's biggest money managers say. removed through the one which you believed you were trying to get. any mortgage despite your credit. numerous years of chemotherapy and debilitating pain.